What is the gravity equation? How to use the gravity formula? 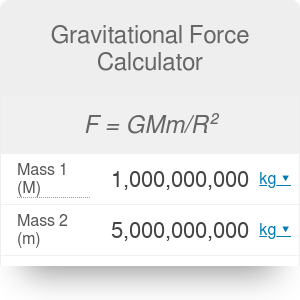 This gravitational force calculator lets you find the force between any two objects. Read on to get a better understanding of the gravitational force definition and to learn how to apply the gravity formula. Make sure to check out the escape velocity calculator, too! Newton's law of universal gravitation states that every body of nonzero mass attracts every other object in the universe. This attractive force is called gravity. It exists between all objects, even though it may seem ridiculous. For example, while you read these words, a tiny force arises between you and the computer screen. This force is too small to cause any visible effect, but if you apply the principle of gravitational force to planets or stars, its effects will begin to show. One of the most common examples illustrating the principle of the gravitational force is the free fall. G is the gravitational constant. It is equal to 6.674 * 10^(-11) N*m^2/kg^2. Did you notice that this equation is similar to the formula in Coulomb's law? While the Newton's law of gravity deals with masses, the Coulomb's law describes the attractive or repulsive force between electric charges. Find out the mass of the first object. Let's choose Earth - its mass is equal to 5.972 * 10^24 kg. Find out the mass of the second object. Let's choose the Sun - it weights 1.989 * 10^30 kg, approximately the same as 330 000 Earths. Determine the distance between two objects. We will choose the distance from Earth to Sun - about 149 600 000 km. Enter all of these values into the gravitational force calculator. It will use the gravity equation to find the force. You can now read the result. For example, the force between Earth and Sun is as high as 3.54 * 10^22 N.
Gravitational Force Calculator can be embedded on your website to enrich the content you wrote and make it easier for your visitors to understand your message.